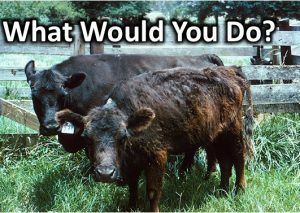 UGA Forage Extension Team | What would you do? What would you do if you found out that there was a toxin in your pastures that caused your cows to spend about 20% less time grazing, drink 25% more water, lose up to 2 points of body condition, and produce about 25% less milk for their calves? What would you do if that toxin lowered weaning weights by 60-90 lbs/head or reduced stocker gain by 40%? What would you do if you found out this toxin was causing you to have a 60-70% calf crop instead of a 90%+ calf crop? If tall fescue is a prominent part of your pastures, this toxin is quite likely at work. And it may be stealing you blind! Nationwide, toxic endophyte-infected tall fescue is responsible for over $2 billion in lost animal performance each year. The UGA Forage Extension Program is proud to announce an in-depth workshop which will detail the mechanisms of fescue toxicosis and provide management strategies to prevent or deal with these challenges. The program will be held on March 22 in Blairsville at the GA Mountain Research and Education Center and on March 23 in Rock Springs at the Walker County Ag Center. The agenda for this program and registration information is available at here. For more information, visit www.georgiaforages.com. Posted in Grazing, Tall fescue, Uncategorized, Workshops. Bookmark the permalink.